For the first time, Kwanzaa, the holiday with roots in Africa that celebrates values, culture and family, was celebrated at the African American Heritage House in San Jose — the public debut for the house and a major milestone for African-Americans in Silicon Valley. It was the dream of the late Lula Briggs Galloway to have a place where the traditions, culture and history of blacks in San Jose could be celebrated and shared. She was the founder and guiding light of the project to transform the house, until her death last year. "Aunt Lula really wanted to make sure we brought the community together," said Sandra Dailey, president and CEO of the African American Heritage House and niece of Galloway. "Today the public was in the house and I'm glad we were able to display some of the history of African-Americans in Silicon Valley." The Kwanzaa festival included a parade, with Mayor Chuck Reed and city council members riding in Corvettes, youth dancers, representatives from the Hispanic Chamber of Commerce and a contingent of proud individuals who marched at the end of the parade. The Jaliya drummers kicked off the parade — to bring "the spirit" to the event, Dailey said — and were still playing late in the afternoon as the festival wrapped up around 4 p.m. An estimated 400 people visited the heritage house on Saturday, a successful debut for a cultural center. "The mayor and all the council members came today to recognize this as an important step for African-Americans in Silicon Valley," said volunteer Aileen Casanave. "To have an historical house as a meeting place." The African American Heritage House is located in Zanker House, one of 27 historic structures in History San Jose's History Park, set within Kelley Park on Senter Road. Built in the mid-19th century, Zanker House originally was located north of Alviso-Milpitas Road on the west side of Zanker Road. It was moved to its location in History Park in 1986. Briggs Galloway was born in San Jose but spent 14 years in Michigan, where she founded and ran a Juneteenth museum. When she moved back to San Jose in 2007, she was stunned to learn there still was no black heritage house, and she set about to make that happen. When she was shown Zanker House by the nonprofit History San Jose group president, Briggs Galloway asked for it on the spot. History San Jose later made it official and the hard part began: collecting donations for the restoration of Zanker House and photos and artifacts for the museum. A brief dedication ceremony marking Zanker House as the site of the first African American Heritage House in San Jose was held last year. 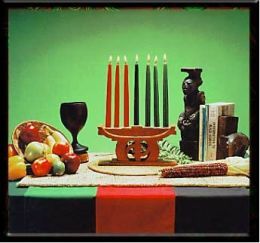 Until the heritage house, "we never had a place for everybody to come together, a place to have a Kwanzaa festival," Bailey said. "It makes me think of Lula and her dream." Josephine and Clement Miles of San Jose said they were touched to see an African-American heritage house in Silicon Valley — even though the building still needs substantial work. "It's nice to see the community come together for a cause," Clement Miles said. At least two young girls had a fine time at the festival but decided they enjoyed the raffle drawing most — they both won prizes and managed to keep them wrapped throughout the day. "I liked the music but I like it when we win the raffle," said Blythe Butler, 10, of San Jose, whose family celebrates all three holidays — Kwanzaa, Hannukah and Christmas. Her sister, Brooklyn, who's 6, agreed. And, oh yeah, "I loved going in that house," she said.